Harvey Hunt Wescott was born February 17, 1835, in Lafayette Twp., Onondaga, NY, and died February 15, 1918, in Newton, Jasper Co., IA, at age 82. Buried in Badger Hill Cemetery, Spring Hill Twp., Tama Co., IA. He is the son of Samuel Wescott of Cortland, Westchester Co., NY, and Bethiah Cuddeback of Vermont. Lovina "Louisa" Abbey was born March 24, 1857, in Lomira Twp., Dodge Co., WI, and died March 22, 1934, in Glendale, Los Angeles Co., CA, at age 76. Entombed in Grand View Memorial Park, Glendale, Los Angeles Co., CA. She is the daughter of Orrin Abner Abbey of Hope Twp., Durham Co., Upper Canada, and Abigail Harrington of Watkins Glen, Tompkins Co., NY. Harvey Hunt Wescott (age 37), a bachelor, and Lovina "Louisa" Abbey (age 15), a maiden, were married August 22, 1872, at the house of Orin Abbey, Multnomah Co., OR. Ethel Abbey Wescott: Born April 1, 1887, in Vienna Twp., Marshall Co., IA; Died July 14, 1988, La Crescenta Twp., Los Angeles Co., CA (age 101). Entombed in Grandview Mausoleum, Grandview Memorial Park, Glendale, Los Angeles Co., CA. Married September 23, 1908, in Toledo, Tama Co., IA, to William Winfield Crippen: Born December 26, 1884, in Pitcher Twp., Cherokee Co., IA; Died March 10, 1956, in La Crescenta, Los Angeles Co., CA (age 71). Entombed in Grandview Mausoleum, Grandview Memorial Park, Glendale, Los Angeles Co., CA. 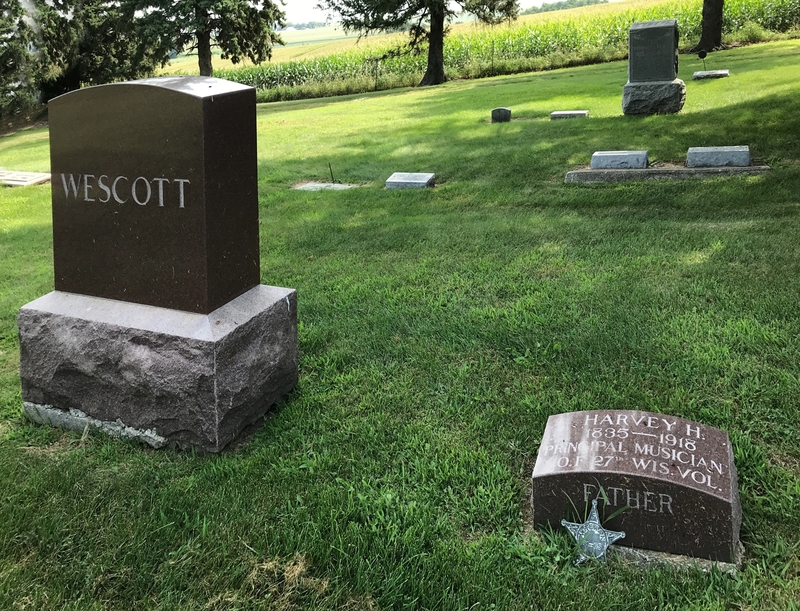 Harvey Hunt Wescott is buried in Badger Hill Cemetery, Spring Hill Twp., Tama Co., IA. Thanks to Find-A-Grave for making these images available. The 1830 U. S. Census taken shows the Grandus, Cuttleback and Wescott families living in Lafayette Twp., Onondaga Co., NY. Samuel Wescott and Bethiah Cuttleback are undoubtedly living there. 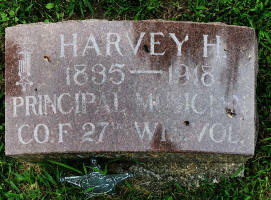 Harvey Hunt Wescott was born February 17, 1835, in Lafayette Twp., Onondaga, NY. Samuel Wescott's Land Patent, issued July 1, 1848, for 40 acres of land in Washington Co., WI. The 1850 U. S. Census taken on August 23, 1850, shows Samuel Wescott (age 47) born in New York with real estate worth $900 is a Farmer living in North Bend Twp., Washington Co., WI. Living with him is Bethiah Wescott (age 45) born in New York. Also living there, all born in New York, are: Willet R. Wescott (age 20); Graudis Wescott (age 18), a Farmer; Henry Wescott (age 15); Erskine Wescott (age 12); Elizabeth Wescott (age 10); and Timothy Wescott (age 8). Lovina "Louisa" Abbey was born March 24, 1857, in Lomira Twp., Dodge Co., WI. The 1860 U. S. Census shows Deloss Wescott, Erskane Wescott, Grandius Wescott and Jane Wescott are living in Kewaskum Twp., Washington Co., WI. Five of Mr. Wescott's sons were soldiers in the civil war. Willet R. Wescott was a Musician in Company D, 12th Wis. Volunteers, Enlisted 21 September 1861, Discharged 14 May 1864. Enlisted in Company F, 27th Infantry Regiment Wisconsin on 12 August 1862. Enlisted in Company I, 2nd Cavalry Regiment Wisconsin on 20 January 1865. Enlisted in Company F, 27th Infantry Regiment Wisconsin on 23 February 1864. Erskine Wescott and Elizabeth R. Bargess were married May 12, 1864, in Fond du Lac Co., WI. The 1870 U. S. Census taken on July 6, 1870 shows Erskine Wescott (age 32) born in New York with real estate worth $3,200 and personal estate worth $580 is a Farmer living in Vienna Twp., Marshall Co., IA. Living with him is Elizabeth Wescott (age 28) born in New York, who is Keeping House. Living with them is Harlow Wescott (age 3) born in Wisconsin. Also living there are: Samuel Wescott (age 68) born in New York, a Retired Farmer; and Methiah Wescott (age 65) born in New York. The 1870 U. S. Census taken in 1870 shows Harvy Wescott (age 27) born in Michigan, with real estate worth $350 and personal estate worth $175, is a Common Laborer, and is living near Forest Grove Post Office, Washington Co., OR. Samuel Wescott moved to Iowa in 1872. Harvey Hunt Wescott and Lovina "Louisa" Abbey Marriage Record. Harvey H. Wescott's Land Patent, issued May 26, 1873 for 157.68 acres of land in Washington Co., OR. 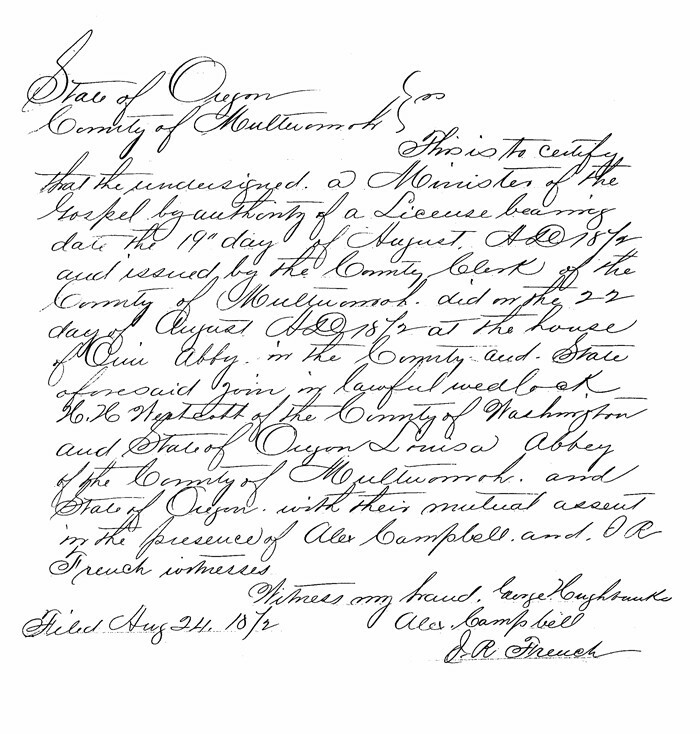 Orrin Abbey's Land Patent, issued May 26, 1873 for 158.92 acres of land in Washington and Multnomah Cos., OR. The 1880 U. S. Census taken on June 22, 1880, shows Aaron Abbe (age 65) born in Canada to Canadian-born parents is a Farmer and is living in Willamette Slough Precinct, Multnomah Co., OR, who was sick on the day of the census taker's visit. Living with him is his wife, Abigail Abbe (age 56) born in New York to New York-born parents, who Keeps House. Also living there is his daughter, Lorinda Abbe ( age 15) born in California to Canadian and New York-born parents. A grandson is also shown: Ch. Lemmen (age 3) born in Idaho Territory to Maine and New York-born parents. An unrelated laborer (age 18) born in Switzerland also lives in the house. Leigh Larson note: Charles Lemmen is the son of Abigail Watson's sister, Arabella Sarah Watson, who married John Wesley Lemmon. The 1880 U. S. Census taken on June 4, 1880, shows John Lemmon (age 47) born in Indiana to Tennessee-born parents is a Contractor and is living at 28 Washington, Portland, Multnomah Co., OR. Living with him is his wife, Mrs. J. W. Lemmon (age 40) born in Kentucky to English-born parents, who is in Millinery. Also living there are his two children, both born to Tennessee and Indiana-born parents: Ellen Lemmon (age 11) born in California; and Chas. Lemmon (age 3) born in Idaho Territory. Also living there are: a widowed or divorced mother, Mrs. G.. L. Prentice (age 31) born in Massachusetts to Massachusetts-born parents, who is in Millinery; and a son, Geo. L. Prentice (age 5) born in California to New Hampshire and Massachusetts-born parents. Leigh Larson note: Charles Lemmon appears in both census reports, but is undoubtedly the same individual. The 1880 U. S. Census taken on June 10, 1880, shows Harvey H. Wescott (age 45) born in New York to New York and Vermont-born parents is a Farmer living in Vienna Twp., Marshall Co., IA. Living with him is his wife Lovina Wescott (age 23) born in Wisconsin to Canadian and New York-born parents,, who is Keeping House. Saml. Wescott (age 75) born in New York to Baden-born parents is a widowed Visitor living in the household. A Music Teacher and a Farm Hand also live in the household. Ethel Abbey Wescott was born April 1, 1887 in Vienna Twp., Marshall Co., IA. The 1895 Iowa State Census shows Harvy H. Wescott (age 59) born in New York is living in Vienna Twp., Marshall Co., IA. Living with him is Lavina Wescott (age 38) born in Wisconsin. Also there is Ethel Wescott (age 1) born in Marshall Co., IA. Samuel Wescott (age 92) born in New York is also living there. The 1900 U. S. Census taken on June 6, 1900, shows Harvy H. Wescot (age 65) born February 1835 in New York to New York-born parents and owns his own house and lives in the City of Toledo, Tama Co., IA. Living with him is his wife of 27 years, Lovina Wescott (age 43) born May 1857 in Wisconsin to Canadian and New York-born parents, with the only child born to her still living. Living with them is their daughter, Ethel Wescot (age 13) born April 1887 in Iowa to New York and Wisconsin-born parents. Also living there is Harvy's widowed father, Samuel Wescot (age 98) born February 1802 in New York to New York-born parents, and married for 73 years. Toledo, Feb. 13. - Samuel Wescott, of this place, has just celebrated his hundredth anniversary. This centenarian was born in New York in 1802, but has resided in Iowa since 1872. Five of Mr. Wescott's sons were soldiers in the civil war. Three of these sons and his daughter, Mrs. Myers, of Los Angeles, Cal., together with fourteen grandchildren and ten great-grandchildren composed the group of immediate relatives at the centennial. A public reception was tendered the aged gentleman by the Epworth League at the Methodist church. Prominent men of the city were the speakers. Mr. Wescott was five years old when Fulton's steamboat made her first trip on the Hudson. He was a voter when iron plows were first used; thirty before matches came into use; 40 years old when the first telegram was sent. He has seen almost the entire growth of the American republic. Samuel Wescott of Toledo, Iowa, has just celebrated his 101st birthday. He is hale and hearty and able to care for his personal wants, even able to shave himself. Leigh Larson note: The City of Toledo, Tama Co., IA is a small community just north of Tama, Tama Co., IA. Toledo has the county courthouse. 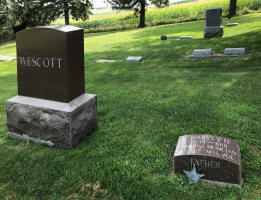 Samuel Wescott died November 10, 1904, in Toledo, Tama Co., IA, at age 102. Buried in Badger Hill Cemetery, Gladbrook, Tama Co., IA. Samuel Wescott Passes Away at the Age of 102. Traer, Nov. 12. - Samuel Wescott, the only man who ever lived in Tama county to be over 100 years old, died at his home in Toledo Thursday at the age of 102. He voted for Roosevelt Tuesday and gave some of the boys good advice before returning home. That night he was taken slightly ill, and the doctor could do nothing for him, claiming his stomach refused to act. He had lived in Tama county for over forty years. He retained well his mental faculties to the last, although he was partially deaf. He had been a Methodist for about seventy-five years. He saw the first steamboat built on the Hudson. The funeral was held yesterday at Gladbrook, his old home before retiring to Toledo. The 1905 Iowa State Census shows H. H. Wescott is living in Toledo Twp., Tama Co., IA. Living with him is Lavina Wescott. Living nearby is Ethel Wescott. The 1910 U. S. Census taken on April 28, 1910, shows Harvey H. Wescott (age 75) born in New York to New York-born parents has his Own Income and owns his own house and lives on College Ave. in the 1st Ward, City of Tama, Tama Co., IA. Living with him is his wife of 37 years, Lovina Wescott (age 52) born in Wisconsin to Canadian and New York-born parents, with the only child born to her still living. The 1915 Iowa State Census shows Lovina Wescott (age 57) born in Wisconsin to Canadian and New York-born parents and having lived in Iowa for 40 years is a married House Wife is living in the 3rd Ward, Toledo, Toledo Twp., Tama Co., IA. She has 8 years of education in the Common Schools. Harvey does not appear to be living there. William Winfield Crippen's WWI Draft Registration shows on September 12, 1918 he was born December 26, 1884 and is employed with Furniture and Undertaking, married, and living at 621 N. 4th St. E, Newton, Jasper Co., IA. 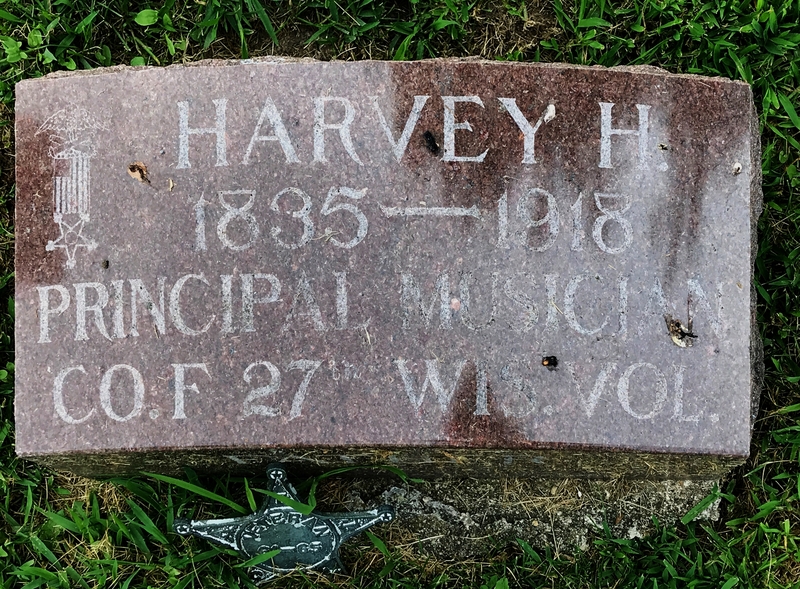 Harvey Hunt Wescott died February 15, 1918, in Newton, Jasper Co., IA, at age 82. Buried in Badger Hill Cemetery, Spring Hill Twp., Tama Co., IA. Samuel, Bethiah and other Wescotts are also buried there, but not Lovina. The 1920 U. S. Census taken on January 3, 1920, shows Lovina Wescott (age 62) is a widow living at 2915 Fourth Avenue, Los Angeles, Los Angeles Co., CA. She was living with her daughter and son-in-law. Lovina was born in Wisconsin to a Canadian father and New York mother. The head of household is William W. Crippen (age 35) an undertaker born in Iowa to Illinois and Iowa parents. His wife is Ethel W. Crippen (age 32) born in Iowa to New York and Wisconsin parents. Also there is their daughter Margaret Crippen (age 6) and son William (age 3 4/12), both born in Iowa. A lodger and four boarders also live there. The 1924 Los Angeles County Voter Registration List shows Mrs. Lovina Wescott is a Republican Housekeeper living at 2722 24th Avenue, Los Angeles Co., CA. The 1924 Los Angeles County Voter Registration List shows Charles W. Crippen (Retired), Mrs. Ethel W. Crippen (Rltr), and William W. Crippen (Undrtkr) are all Republicans and are living at living at 2722 24th Avenue, Los Angeles Co., CA. The 1926 Los Angeles County Voter Registration List shows Mrs. Ethel W. Crippen (Rl Estt), and William W. Crippen (Undrtkr) are all Republicans and are living at living at 2722 Harcourt Avenue, Los Angeles Co., CA. The 1928 Los Angeles County Voter Registration List shows Mrs. Lovina Wescott is a Republican Housewife living at 2904 Honolulu Avenue, Los Angeles Co., CA. The 1928 Los Angeles County Voter Registration List shows Charles W. Crippen (Retired), Mrs. Ethel W. Crippen (Housewife), and William W. Crippen (Undrtkr) are all Republicans and are living at 2904 Honolulu Avenue, Los Angeles Co., CA. The 1930 Los Angeles County Voter Registration List shows Mrs. Lovina Wescott is a Republican Housewife living at 2904 Honolulu Avenue, Los Angeles Co., CA. The 1930 Los Angeles County Voter Registration List shows Charles W. Crippen (Retired), Mrs. Ethel W. Crippen (Housewife), and William W. Crippen (Mrtry) are all Republicans and are living at 2904 Honolulu Avenue, Los Angeles Co., CA. The 1930 U. S. Census taken on April 12, 1930, shows Lavina Wescott (age 72) is a widow living at 2908 Honolulu Avenue, La Crescenta Twp., Verdugo, Los Angeles Co., CA. She was living with her daughter and son-in-law. Lavina was born in Wisconsin to a Canadian father and New York mother. The head of household is William Crippen (age 45) an undertaker born in Iowa of Illinois and U.S. parents and married at age 23. His wife is Ethel W. Crippen (age 43) born in Iowa to New York and Wisconsin parents and married at age 21. Also there is their daughter Margaret Crippen (age 16), son William W. Crippen (age 13), both born in Iowa. William's father, Charles W. Crippen (age 73) who is a widower born in Illinois to U.S. parents. The 1934 Los Angeles County Voter Registration List shows Mrs. Lovina Wescott is a Republican living at 2904 Honolulu Avenue, Los Angeles Co., CA. The 1934 Los Angeles County Voter Registration List shows Charles W. Crippen, Mrs. Ethel W. Crippen, and William W. Crippen are all Republicans and are living at 2904 Honolulu Avenue, Los Angeles Co., CA. The 1934 Los Angeles County Voter Registration List shows Miss Margaret Crippen is a Republican living at 2900 Honolulu Avenue, Los Angeles Co., CA. Lovina (Abbey) Wescott died March 22, 1934, in Glendale, Los Angeles Co., CA, at age 76. Entombed in Grand View Memorial Park, Glendale, Los Angeles Co., CA. VERDUGO CITY, March 23. - Funeral services for Mrs. Lovina Wescott, 77 years of age, will be conducted at the Crippen parlors, Monday at 2 p.m., with Rev. Luther Reynolds, Methodist minister of Los Angeles, and Rev. W. L.. H. Benton, rector of St. Luke's of the Mountains Episcopal Church, La Crescenta, officiating. She died at a Glendal ehospital last night following an emergency operation. She came to California from Iowa fourteen years ago. She leaver a daughter, Mrs. W. W. Crippen, and two grandchildren, William and Margaret Crippen of Verdugo City. The 1936 Los Angeles County Voter Registration List shows Chas. W. Crippen (retired), Mrs. Ethel W. Crippen (Housewife), Miss Margaret W. Crippen (P. O. Clerk), and William W. Crippen (Mortuary) are all Republicans and are living at 2900 Honolulu Avenue, Los Angeles Co., CA. The 1938 Los Angeles County Voter Registration List shows Mrs. Ethel W. Crippen is a Republican Housewife living at 2904 Honolulu Avenue, Los Angeles Co., CA. The 1938 Los Angeles County Voter Registration List shows Miss Margaret W. Crippen (P. O. Clerk), and William W. Crippen (Mortuary) are Republicans living at 2904 Honolulu Avenue, Los Angeles Co., CA. YES-I BELIEVE WE ARE LOOKING AT THE SAME SAMUEL! 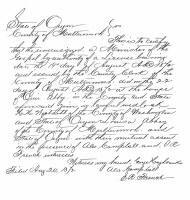 TODAY I SPOKE WITH A MR. CRIPPEN WHO TOLD ME THAT SAMUEL WAS HIS G.G.GRANDFATHER THROUGH HARVEY HUNT WESCOTT. HIS INFORMATION IS FROM A FAMILY BIBLE. HE SHOWS SAMUEL B.FEB. 12, 1802 AND D. NOV.9, 1904. HE WAS MARRIED TO BETHIA CUDDEBACK. THEY WERE BOTH BORN IN N.Y. SAMUEL'S CHILDREN WERE: DELOS GARY WESCOTT, WILLET GARY WESCOTT, GRADIS C., HARVEY HUNT WESCOTT WITH WHOM SAMUEL MADE HIS HOME AFTER HIS WIFE DIED, ERSKINE, ELIZABETH, TIMOTHY. HE HAD A BROTHER JOHN BORN IN NY.NY. ON NOV.16, 1797. HE MARRIED A CHARLOTTE COLEMAN. I AM TRYING TO CONNECT HIM TO MY FAMILY. MY GREAT GRANDFATHER WAS DR. AUSTIN BROOK WESCOTT B.OCT. 18, 1820 IN WARWICK, FRANKLIN COUNTY, MASS. HE HAD A SISTER, EMELINE WESCOTT WHEELER. SHE MARRIED A RUFUS B. P. WHEELER. HER OBITUARY SAYS SHE WAS THE DAUGHTER OF HORI WESCOTT. JOHN F. WESCOTT OF SOUTH ROYALSTON, MASS WAS A BROTHER AND HARRIETT WESCOTT SHERWIN OF SOUTH ROYALSTON WAS A SISTER AS WAS MRS. JAS. S BROWN OF SPRINGFIELD. I HAVE INFO THAT HARRIETT, B.MAR. 16, 1808, D.OCT. 31,1882 IN TAMA CITY, IOWA, NOW TOLEDO. THERE MUST BE A CONNECTION THERE SOMEWHERE. I CANNOT FIND ANYTHING ON JOHN F WESCOTT. I HAVE A PICTURE OF SAMUEL FROM THE NEWSPAPER CELEBRATING HIS 100TH BIRTHDAY. NO DATE ON THE ARTICLE EXCEPT THE DAY OF HIS BIRTH, FEB. 12. I WOULD BE VERY MUCH INTERESTED IN ANY INFO YOU HAVE. I DON'T HAVE ANYTHING BEYOND AUSTIN. My son Lee told me about finding inquiries about Samuel on the internet. I am sorry that I do not have any additional information than what he has already given to you. One thing I noticed in you message #53, you referred tp "Tamy City", Iowa now Toledo. Actually Tama and Toledo are two towns that are very close together the locals refer to them as "the Twin Cities" Tama is the county seat of Tama county, and both town are in Tama County. It is my recolection that Samuel was residing in Toledo at the time of his death. He is buried in Badger Hill cemetary near Gladbrook, Iowa. You also mentioned speaking to a mr Crippen. I recall my grandmother speaking of(I believe)Ethel and Wynn Crippen who lived out of state. I aloays thought that they were family friends but your letter has enlightened me on that account. It my be of interest tht my father was named after "Uncle Harv" Harvey Hunt and his grandfather Erskine. I'm afraid that he never liked the name Erskine and for years denied even having a middle name. One last thing, you mentioned a Gradis Wescott. I don't know that I ever saw his name spelled, but Grandmother always refered to hem as "Graudis" Oh yes, ironically my mother's name was Helen also. WILLET R. WESCOTT, farmer and dairyman; P. O. Boltonville; has 100 acres; settled in the county in 1846; is the son of Samuel and Bethiah (Cuddeback) Wescott; was born in Tioga Co., N. Y., Feb. 15, 1830; in 1846, came with his parents to Washington County and settled in Town 12, Range 20—now Farmington—making his home on Sec. 7; two years later, began teaching school, being the second to act in that capacity in the town; he taught nine winters in succession. Was married in this town (Farmington), April 27, 1854, to Miss Thamar Stanley, daughter of Marshall Stanley, of Ohio; they had two children; one died in infancy, unnamed; and the other, Olin, died when 6 years of age. Mis. Wescott died Oct. 1, 1866. Mr. Wescott was married again, Aug. 27. 1867, in Farmington, to Miss Kate Ross, daughter of John and Elizabeth (McCormack) Ross. Mrs. Wescott was born in Wauwatosa, Milwaukee ('o., Sept. 25, 1846; they have seven children—Cora B., Lou E.. Earl R., Will S., Bruce P., Elizabeth M. and Mary Josephine. Has served as Superintendent of Schools of Farmington three terms, and as Justice of the Peace two terms ; was once elected Chairman, but did not qualify. Mr. Wescotts father, Samuel Wescott, was a pioneer of 1846 of this town; now a resident of Iowa. Mr. Wescott enlisted, in September, 1861, in Co. D, 12th W. V. I., and served till May, 1864; being a musician, he was transferred to a band, and served as a musician; was with his regiment in all the engagements in which they participated.